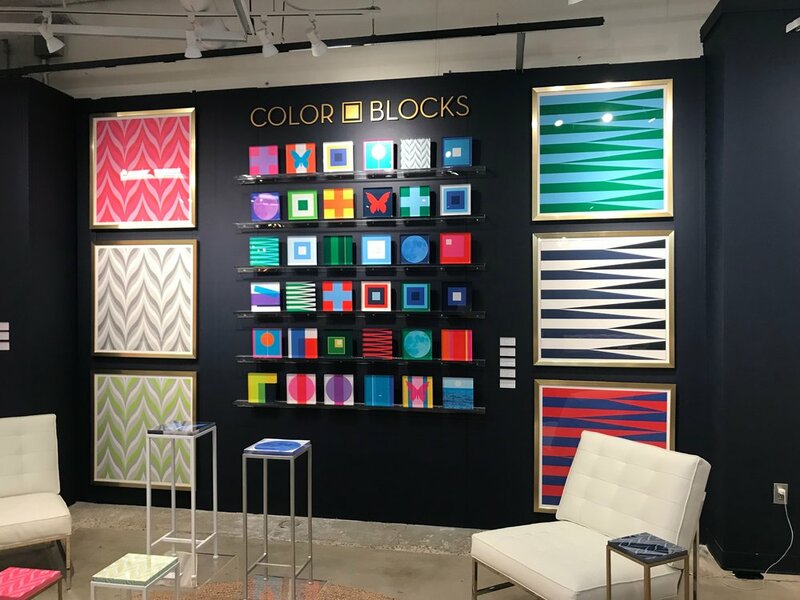 Twice a year members of our team head to High Point, North Carolina to get inspiration, see what’s new in the design world, and place orders for clients at High Point Market. Cheryl and Stephanie spent four days in High Point earlier this month. We sat down with them to hear about their favorite trends, moments, details, and more! I love this Spring High Point. There was tons of color (finally!!) and a lot of Art Deco inspiration. We saw a lot of wood furniture stained with color rather than your standard wood stain. Greens, yellows, and blues were everywhere. There were also a lot of Deco-esque curved elements to the furniture we saw. Particularly curved sectionals, tulip shaped chairs, and channel tufting. I also noticed that where last year there were lots of mixed metals in fixtures and finishes, this year mixed materials made an appearance in furniture design. Chairs used velvet and leather, leather and metal, and details were key. Embroidery, carving, nail head details… Craftsmanship and detail work is definitely on the rise! A few of the vendors also included inspiration boards in their presentation areas. When we present to a client we frequently include a few mood boards for them to reference. It was great to see what the in-house designers were inspired by when they created the furniture, lighting, and fabrics that we were seeing. What were your favorite trends? I was so happy to see color and playfulness back in design. For years and years it’s been nothing but tonal design with layers and layers of gray. Now, we’re seeing pinks, yellows, greens, oranges, and reds all making an appearance in design. Artwork is also much more playful and youthful. It doesn’t take itself so seriously. I loved the amount of vibrant portraiture and graphic patterns. I loved the use of multiple design styles in one space. For example, I loved the mix of midcentury modern furniture and classical elements, like a marble bust. This new trend allows for a more personalized, eclectic design style, which I love. Customization was also a big trend we saw, that I love. Everything from artwork to furniture to light fixtures- there were so many options. When you have the kinds of creative clients we have, this is so helpful! What vendors really stood out for you? I loved this vignette by Highland House. There was a live tree flanked by moss and live flowers. Really everything Highland House did this year was so fresh and exciting. The chair in this vignette felt so Spring-y and vibrant. It really was inspiring. I also loved this collaboration between Chaddock Home and House of Harris. House of Harris creates amazing fabrics and wallpapers. For this particular item, they lined a Chaddock piece with their Baxter wallpaper pattern. The result was gorgeous. Another detail I loved in this vignette: The eclectic artwork. The marble bust, neon artwork, and more traditional wallpaper and furniture makes this space layered and so fun! What excited you the most? I love the use of detail and craftsmanship! There were hand painted side tables and carvings and inlays in tables and chairs that really elevate the design of the furniture. That attention to detail really adds depth and interest to the pieces we’ll be placing in our clients’ homes. I’m also so excited about the mix of leather, wood, and metal in furniture design. This table was amazing, a real feast for the eyes. And, again, check out the detail work. There’s a pattern in the metal base of the table (which is wrapped in leather too) which you wouldn’t notice at first. But that’s what makes good design- that kind of attention to detail and appreciation for artistry. Lastly, I just fell in love with these unique pieces. 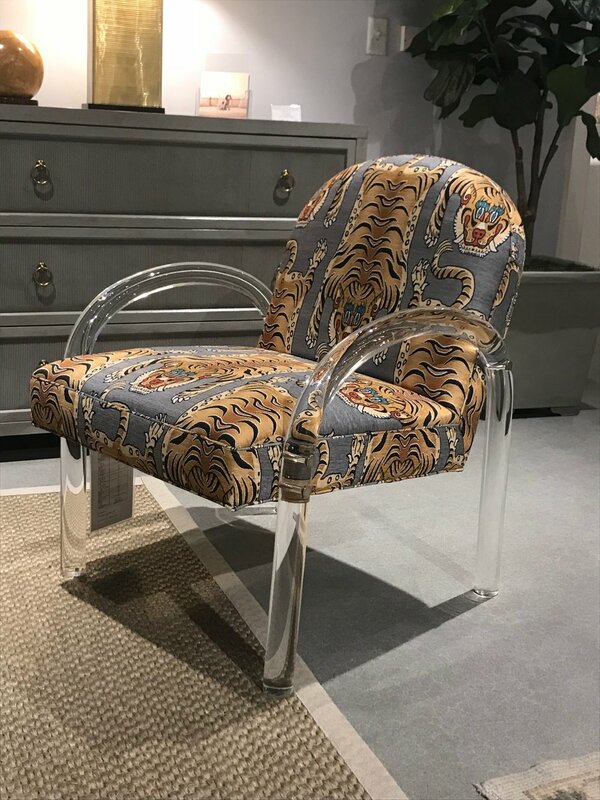 The lucite chair with the tiger patterned fabric is completely amazing. 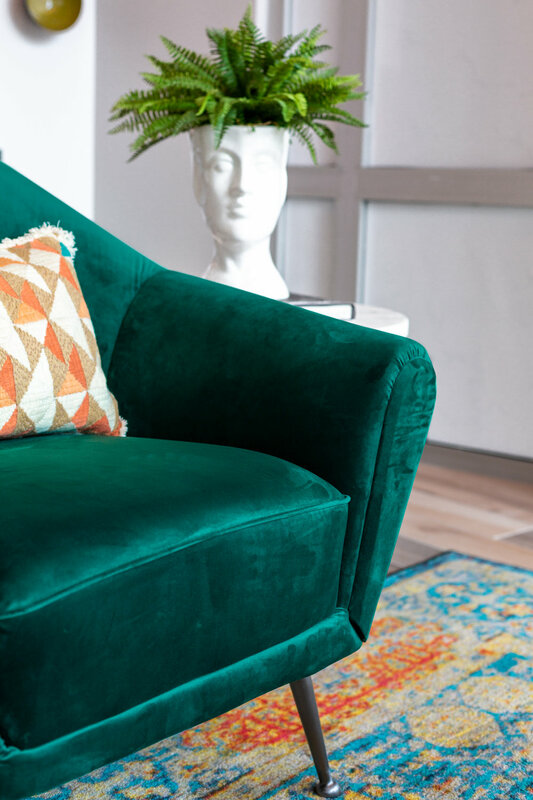 The emerald green chair is a great statement piece. The patterned side board cabinet has a great global feel that is very “Crimson” and the carved cabinet is a real testament to craftsmanship. What was your favorite High Point Market moment? Well, Cheryl and I won a trip to Paris, courtesy of Bernhardt Furniture! It was a thrilling moment, and definitely my favorite! So much color! Thankfully there is lots of color coming in. We saw a lot of pink, green was a hot color, navy, and bright red. Oh and yellow!! I’m so glad to see red coming back into a trend. It’s so refreshing. There were a lot of nods to Art Deco, too. You could see its influence in furniture design, light fixtures, hardware and even patterns. Layers of gray are finally diminishing and the farmhouse, reclaimed wood trend is very minimal which I was happy about. We did see ‘mink’ as a color, that is a bit of gray and brown. I’m not sure I’m ready for that color to be back and to replace gray as a neutral. But it does have a bit of warmth to it. We also saw furniture pieces designed with a very architectural feel and style. I was especially drawn to the Hickory Chair line by designer Ray Booth. Definitely the use of color. But also, the use of detail. We always appreciate attention to detail at Crimson. Even if you don’t immediately notice a carving or embellishment or, say, a hammered detail in a metal bed frame, when your eye lands on it, it just brings your appreciation for the space you’re in to the next level. We live for that moment of happy surprise. I always love stopping by Design Legacy’s room at High Point. Everywhere you look, there’s something beautiful and full of meaning. I’m always drawn to globally influenced design so Design Legacy is an obvious favorite. The mix of patterns and colors makes me feel like I’m in a candy store. The owner, Kelly O’Neal, is infinitely creative and she collaborates with other amazing designers. I always leave feeling excited to design after visiting the room. I also loved Alexa Hampton’s work with Theodore Alexander. The red tufted, velvet couch was amazing and well placed in the room. The whole space felt rich, lush, and glamorous while still inviting and comfortable. It can be tough to find that perfect balance. I was definitely taking notes! I also loved a lot of what Highland House is doing this season! The furniture and color play was so fresh and refreshing. It felt perfect for Spring and got me very excited for our Summer projects. Stephanie took a hula hoop break… that was definitely one for the books. But then again… we did win a trip to Paris. So it’s a tie. Read more about Spring/Summer design trends in our trends series! Today on the blog, learn about the challenges and solutions involved in creating an Art Deco inspired, multifamily housing project for a long term client. Also, join us for a “tour” of the design vision! We love traveling and exploring the world around us, which is why we’re particularly excited about this season’s love of globally inspired design. But what can you expect from this trend? With every new season comes new, exciting design trends. This Spring/Summer, we’ll be seeing a lot of Retro/1950s inspired design. Let’s take a closer look! With every new season comes new, exciting design trends. This Spring/Summer, we’ll be seeing a lot of Art Deco inspired design. Let’s take a closer look! With every season comes a new wave of design inspiration and fresh trends. We know it can be daunting keeping up with all the updates and changes that come with the advent of Spring, so we’ve got you covered! In today’s blog, we’re going to introduce you to three trends to watch for. Keep an eye out for future blog posts in which we’ll take you deeper into each one of these individual design aesthetics ! Wondering how to find out about new blogs? Follow us on Instagram to stay updated! The first trend on our radar is a dreamy hearkening back to the domesticity of the 1950s, seen through a nostalgic lens. Think retro looks, color blocking, feminine details, and vibrant pastel patterns. 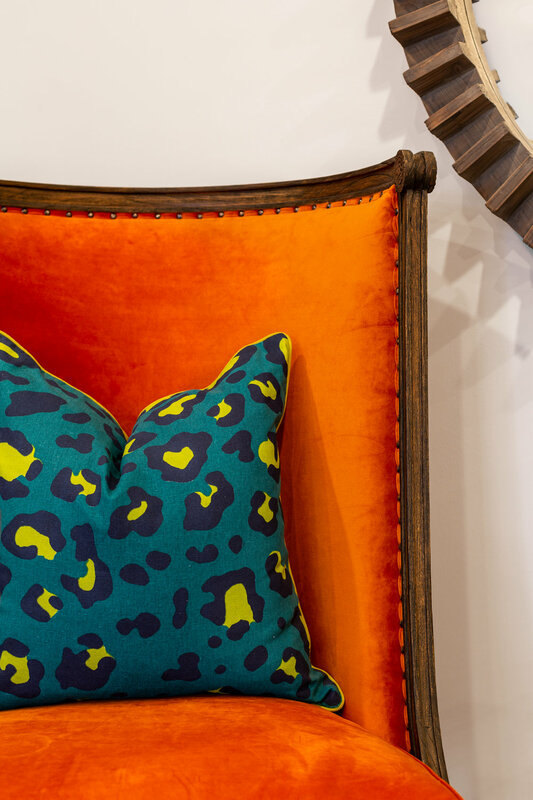 Bright pops of color, large patterns, and design with a playful edge will make appearances this season. Use vintage furniture or look for new pieces that have soft edges and timeless appeal. The second design trend is right up our alley: global influences! Many designs this season will draw inspiration from the mountains and forests of South America, the terrain of the Australian outback, indigenous cultures throughout the world, and generally, a sense of cultural tradition, diversity, and history. Natural materials will be used heavily, interspersed with beautiful metallics. This trend invites you to find a welcome respite and escape, right at home. We’re seeing yet another trend this season that looks back in time for inspiration: Art Deco is back! This season keep your eye out for curved nouveau silhouettes, brushed metallics, and dusty shades of green, navy, and pink. Feminine details along with rich textiles will be layered with luxurious glasswork and metals. Thankfully this reemergence of the Art Deco trend will be updated and elevated by modern lighting and imaginative details. Be sure to check back in next week when we’ll be discussing these trends more fully! Have you ever wondered what it's like to hire an interior designer? Or have you worked with a designer before, but wondered what goes on behind the scenes? We're taking you behind the scenes in our blog series, The Life of a Design Project! In this four part series, follow along as we take you from the Design Concept phase of a residential project, all the way to Install Day! For the project we'll be following in this series, the clients are remodeling their basement, furnishing multiple rooms in their home, remodeling their powder room, and putting in new window treatments throughout the home. They also have a great room with a unique design challenge: the room is open and airy with walls that are, floor to ceiling, 20 feet tall and completely bare. The lead designer on their project is Jessica Jones! In this week’s (and the final) installment, we'll take you behind the scenes on Install Day! 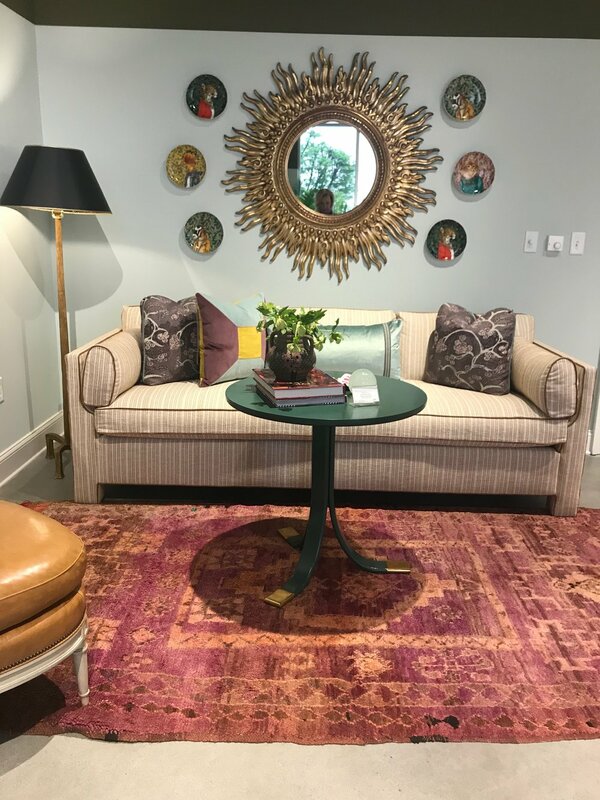 Before Install Day can occur, designers work through the Design Phase, Selections Phase, and Construction Phase to create the perfect space for their client. Did you miss our other installments, or has it been a while since you read the beginning of this series? Refresh yourself on what goes into a Design Project below! Install Day is really, what makes it all worth it. It’s the day on which a designer can see their vision come to life and reveal the results of months of hard work to their client. It’s the “wow” moment that all clients dream of, and it’s definitely one of our favorite days in the life of a design project. The day before Install Day, a designer is still working on last minute touches. She will select items from our inventory and even do some local shopping if necessary. This covers everything from throws and pillows to artwork and accessories: items that finish a room’s design. For this project, Jessica selected pillows and blankets from our stock as well as several vases and art pieces! On Install Day, Jessica coordinated delivery of all furniture and large items with our white glove delivery service, Columbus Easy Move. As the movers installed the furniture under Jessica’s direction, draperies and artwork were installed. Did you know? The average install takes 6 hours for a whole home/ 2 hours for one room. Accessorizing usually takes an additional 3 to 6 hours. Two day installs are ideal to make sure everything is in its proper place! After the large pieces were installed, Jessica placed the soft goods and accessories she had selected throughout the house. She finessed and layered pieces in the great room, dining room, bedrooms, and spare room in the finished basement. The next day, Jessica walked with the client through their newly finished space, pointing out all of the new additions. She asked them for their first impressions, their immediate reactions, and if there was anything they’d like changed. 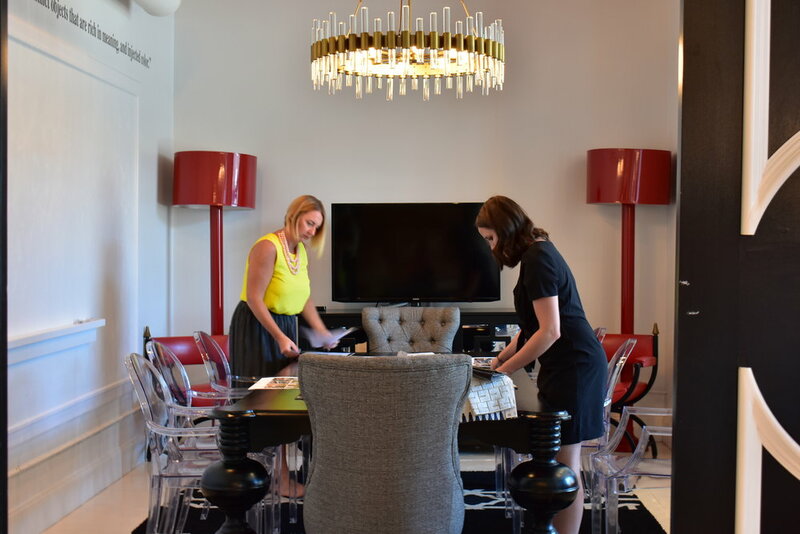 After the walkthrough, Jessica put together a proposal and invoice for the client, listing all of the accessories and art pieces she’d placed on install day. The client lived with the new items for a week, and sent back anything they didn’t want. And thus, the design project was complete! Thank you for following along with us on this journey! If you’d like to work with us on your project, send us an email at hello@crimsondesigngroup.com or give us a call at 614-444-3743! We’d love to talk with you! Vivid. Inviting. Eclectic. Luxurious. These are not words typically associated with student housing. But, then again, nothing about Luxe Belle is typical. From the beginning, we knew that we wanted to create a student housing experience unlike any other. Working closely with our client, builder developer Preferred Living, we began our design using their brand aesthetic as a starting point. 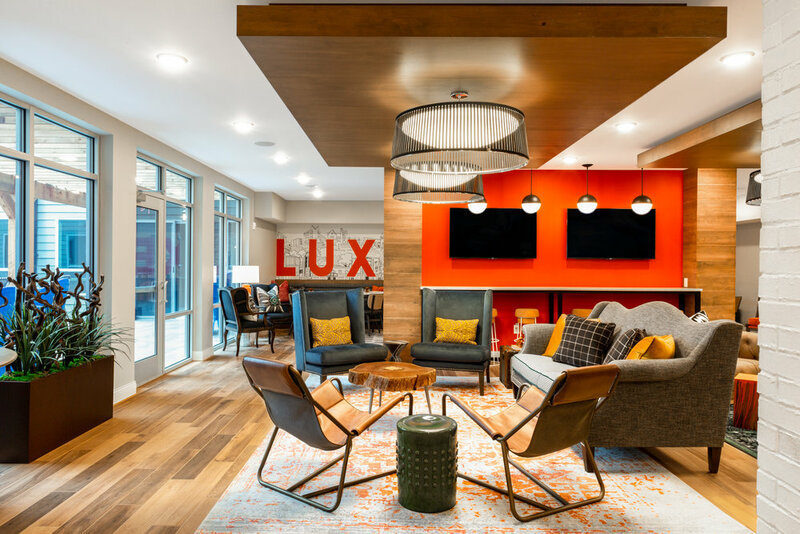 Specializing in multifamily housing for young professionals, the Preferred Living brand draws inspiration from the craftsmanship of the past, the atmosphere and amenities of luxury boutique hotels, and most importantly, the needs and lifestyles of their tenants. As the tenants of this building would be a bit younger than Preferred’s typical customer, we needed to design a space that felt more contemporary and offered amenities perfectly suited for a student’s needs. The future inhabitants of Luxe Belle would be students of The Ohio State University, ranging in age from eighteen to their mid-twenties (millennials and generation z students). This generation is known for being content creators, never without their cellphones and always looking for an Insta-worthy pic. They spend time outside their rooms, looking to build a community and these group gatherings make for prime opportunities to post to social media. With most college level work requiring an internet connection, they need high speed WiFi and plenty of outlets. Their style is a combination of vintage inspired and fashion forward pieces. With all of this in mind, we got to work. We sought to create a design forward, colorful space with a youthful vibe and plenty of distinct areas for studying, entertainment, and socializing. Today’s colleges and universities create common spaces that are living-learning environments. We decided to take that idea and run with it, by making the clubhouse a multi-use space: ideal for learning, dining, gaming, and more. 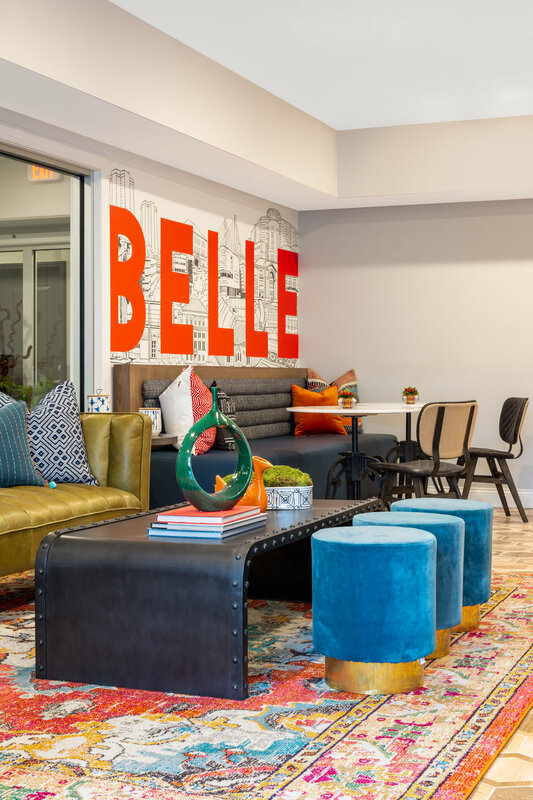 We wanted Luxe Belle to be a place where students could create their own, unique community. To that end, in addition to a lounge area, we included several arcade games, multiple seating areas, and a popcorn machine in our design. Plus, with multiple TV screens, we imagined that the space could be used for viewing parties and game nights. The clubhouse also features a gym and tanning booth; we really covered every base! For post-studying, relaxed hang outs, we designed a lounge that shares a wall with a brand new Taco Bell, the building’s name sake. With its steamer trunk, cognac colored couch, and teal chairs, this room is a calming call back to vintage design with a contemporary edge. Another favorite detail in the clubhouse’s design is the foyer’s reception area. From the glass decanter light fixture above the custom built front desk, to the hand made, peacock blue cabinetry behind it, the building’s entry way is full of vintage inspired details that elevate the space while maintaining a youthful flair. Interested in working with us to design your one of a kind multifamily or student housing project? Call us at 614-444-3743! We’re no stranger to new build projects however, when our builder developer client, Preferred Living, asked us to work on Berkley House, they also wanted us to help establish their brand’s look: stylish and relaxing environments with an emphasis on living well. As their newest property, Berkley House needed to attract and retain their ideal customer. Preferred Living’s commitment to their brand has set them apart from the competitive apartment and condo market so we wanted to make sure that from the first step inside Berkley House’s clubhouse, potential tenants would know exactly what to expect from living in a Preferred Living property, namely a life well lived. Our firm was involved from day one of the project, including the design of the construction plans, space planning, material selection, lighting, design of custom architectural elements, and of course, bringing Preferred Living’s brand to life. We were asked to include a theater space, business center, work- out facilities, and lounge. But most importantly, we were to design a space that reflected their brand. 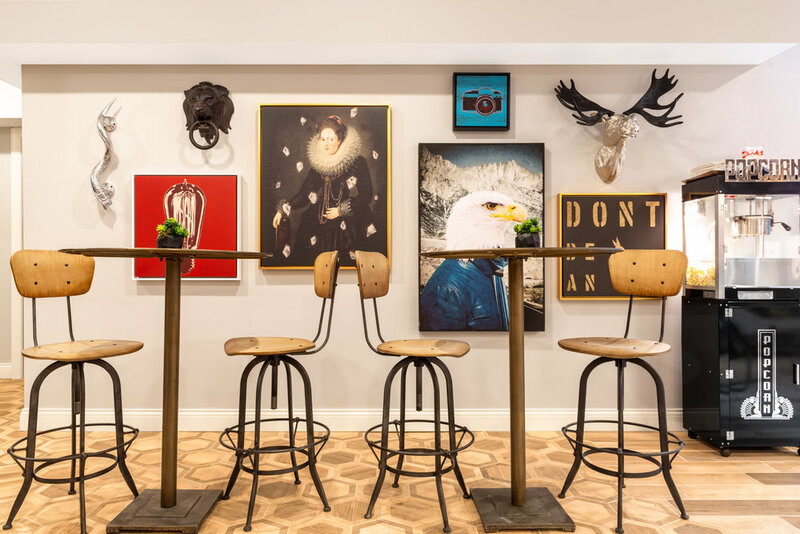 With young professionals in mind as Preferred’s ideal tenant, our team went to work designing a space that was hip and inviting with natural woods, vibrant wallpaper, modern furniture, and custom-designed components geared to feel like you were staying in a posh, boutique hotel. We paired strong architectural elements with muted grays, timeless oriental rugs, and velvety fabrics to create an environment full of character while remaining clean and modern. 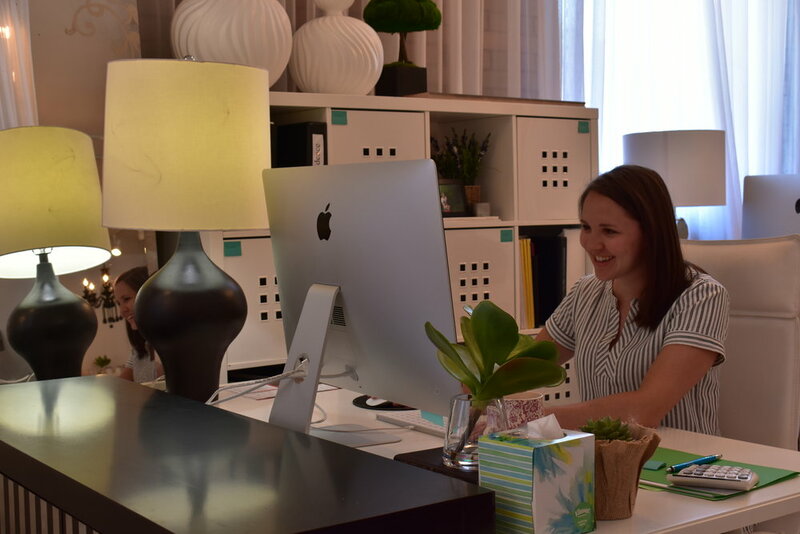 The reception area features a custom designed front desk that signals to tenants and guests that they are entering a space elevated by even the smallest details. The geometric design of the desk’s molding is a nod to modern art while the tawny wood of the desk reflects the clubhouse’s rustic setting. 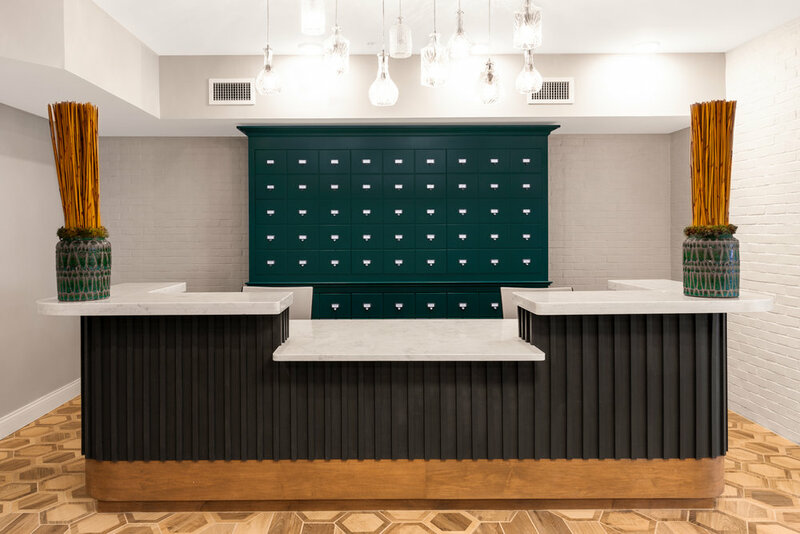 From the reception area, guests and tenants walk towards a center corridor featuring custom corbels, accent chandeliers, lush velvet fabrics, and a pressed tin ceiling that divides the two halves of the clubhouse. The cerused wood floor that guides tenants from the reception space to the heart of the clubhouse features an alternating pattern that subliminally divides the clubhouse into distinct living and working zones. A duo of custom made billiards tables sits in the center of the lounge area, abutted by a tufted, toffee colored banquette and vintage inspired light fixtures on one side, and an upscale arcade area on the other. This space is the perfect place to unwind and revel. Directly opposite from the lounge is a bar featuring locally sourced marble, modern bar stools, and a coffee station. This space flows effortlessly into a sitting area distinguished by a stone fireplace and luxurious couches. Directly behind this warm and inviting sitting area is a business center equipped with multiple marble meeting tables and computer work stations. Sustainable design was considered when choosing the wood floors, corbels, beams and mantel. 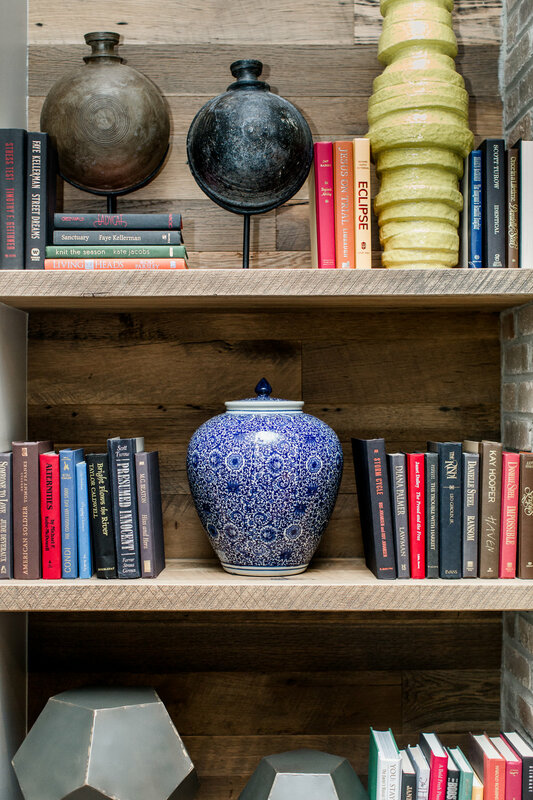 These elements were created with reclaimed wood from other buildings. We collaborated with our Amish craftsmen to create unique and sustainably sourced wood features. Local artisans were also chosen to implement our vision for an industrial-chic metal and glass wall used to divide the game room from the common room. We enjoy pushing the design envelope and with Berkley House, the result is a visually stunning, multi-purpose space that is enjoyed by residents every day and truly encourages them to live well. Curious what Cheryl’s favorite things for 2018 were? Wonder no longer! Merry Christmas and Happy New Year from Crimson! Happy Holidays from Crimson Design Group! Cheryl's End of Year Address! As we wrap up business for the year, Cheryl takes a look back at 2018! Happy Holidays from Crimson Design Group! This week on the blog, a note of appreciation! In part three of our behind the scenes series, The Life of a Design Project, we’re walking you through the construction phase of the design project process! Our Most Ambitious Project Yet! Join us as we embark on our most ambitious project yet! In part two of our behind the scenes series, The Life of a Design Project, we’re walking you through the selections phase of the design project process! In this quarter’s edition of The Luxe Life with Louie, we take you to Veritas and The Citizens Trust in Columbus for a bourbon tasting! Plus, Louie shares his tips for expanding your bourbon palate! Have you ever wondered what it's like to hire an interior designer? Or have you worked with a designer before, but wondered what goes on behind the scenes? We're taking you behind the scenes in our new blog series, The Life of a Design Project! In this four part series, follow along as we take you from the Design Concept phase of a residential project, all the way to Install Day! For the project we'll be following in this series, the clients are remodeling their basement, furnishing multiple rooms in their home, remodeling their powder room, and putting in new window treatments throughout the home. They also have a great room with a unique design challenge: the room is open and airy with walls that are, floor to ceiling, 20 feet tall and completely bare. In this month's installment, we'll show you all that goes into the first step of any interior design project, developing and presenting the Design Concept. The first step in any design concept? The designer reviews the notes that our business development coordinator and our Design Director made during initial conversations with the client. 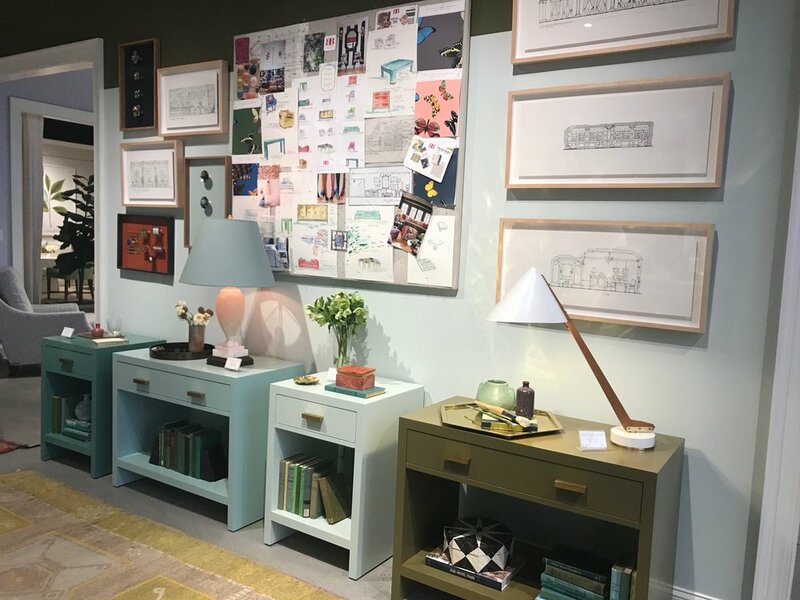 From these notes the designer learns what the clients needs are, what their lifestyle is like, if they favor furniture based on function over aesthetic (or vice versa), and what their design tastes are as well. Do they want a Glam look? Modern or Midcentury? Contemporary or Traditional? The notes help the designer pin point exactly where they should be taking the design! Based on these notes, the designer will begin researching. They'll go on a Pinterest and/or Houzz deep dive and pin inspiration images. They'll also go to publications' (such as Architectural Digest) websites, for further inspiration. If the client has their own Pinterest or Houzz page, the designer will incorporate images from those pages into their concept, as well. The research phase is crucial to the design process. Here at Crimson we pride ourselves on having an incredibly talented and versatile team, and while we do our utmost to pair designers with projects that best suit their own personal taste, occasionally a designer will be assigned to a project that challenges them. For example, if a designer's own tastes skew to the Traditional but their client has a taste for Mid-Century Modern design, the research phase will help the designer set the correct tone for the rest of the project. For this particular project, the clients defined their personal style as being clean and sophisticated, while still maintaining a homey feel. Their Lead Designer, Jessica, began the research phase with those key words in mind: clean, sophisticated, and homey. She took her time collecting inspiration photos and when she noticed that her photos were beginning to sync up exactly with those that the client had pinned on her own Pinterest board, she knew she had a firm handle on what direction to take the design. Jessica hard at work drafting layouts in AutoCAD, doing research, and building a design presentation! After the Research Phase of a design project, the designer can begin developing the project's design concept! The design concept ultimately defines which textures, colors, and patterns that will inform the overall design of the project. For this project, Jessica began by pulling fabrics, paint swatches, finishes, and wall paper samples. 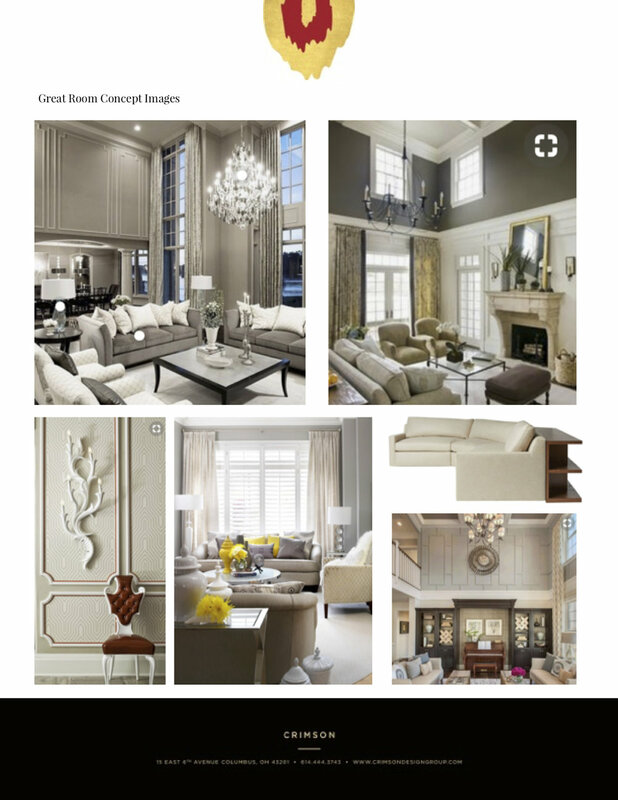 As the clients hadn't indicated which colors they preferred or disliked, Jessica decided to develop two full design concepts for the largest room (the great room) and to complete one strong design concept for the second largest room (the basement). Design concepts for this series's project! Using blueprints of the home, Jessica input the dimensions of each room into the AutoCAD software in order to build a 2-D model of each room. Within each room's 2-D model, Jessica then began dropping in scale models of furniture items. 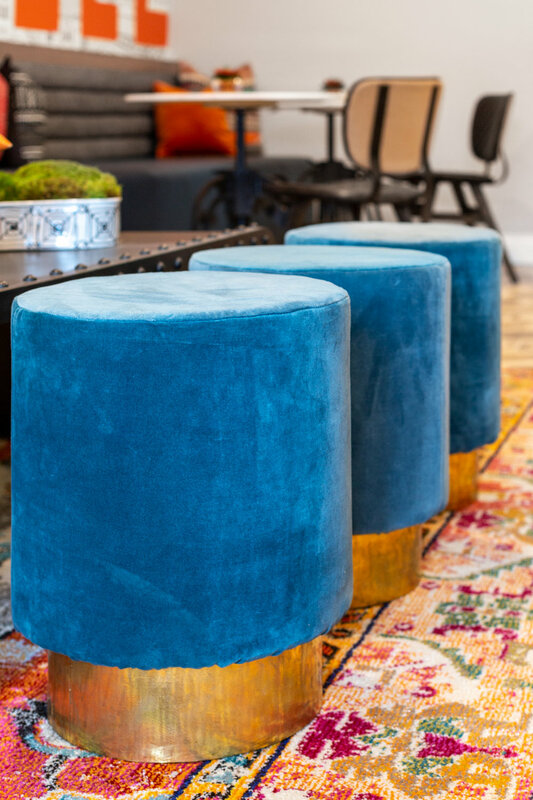 Using standard dimensions of everything from coffee tables to sofas, Jessica was able to plan where furniture items would be placed in such a way that each room's functionality and flow would be optimized. Putting the furniture layout into AutoCAD at this phase allows the client to give feedback about their preferences during the presentation, and can also inform the shape and size of furniture selected by the design team in the next phase. It can also help to make the design concepts feel more real and immediate. For example, seeing the wallpaper that their designer has selected next to a rendering of the room in which it will be placed brings the design concept to life! In our next edition of this series, you'll get to see the rendering of the amazing changes Jessica made to the Great Room's giant wall, below! 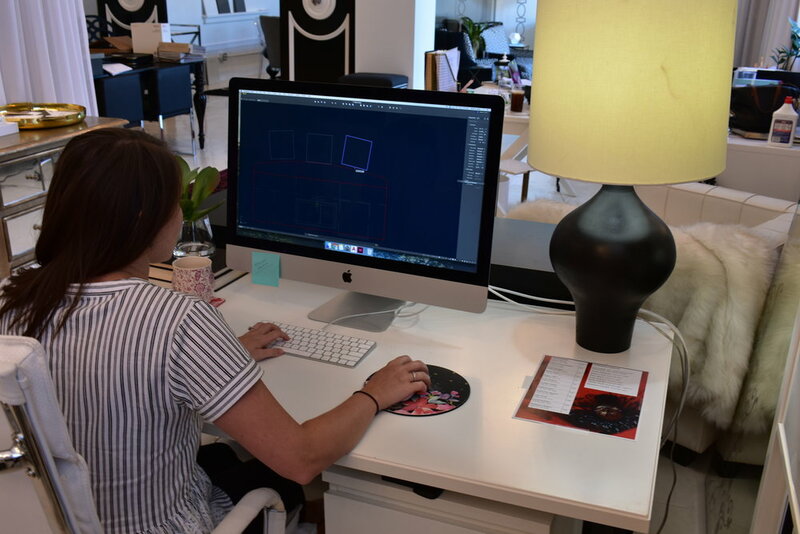 After the space planning and AutoCAD is complete, the Lead Designer is able to determine what a client's needs for furniture, lighting, wall coverings, and fabrics will be. Keeping in mind the budget that the client gave them in their first meeting, the Lead Designer will work from room to room listing everything that the client will need and put numbers to each item. Usually starting in a mid-range,just to get the conversation going, this preliminary budget will help the client decide where they want to allocate more money (eg. for a durable sofa) and where they want to conserve (eg. for less expensive light fixtures). This budget will also help the client think about things they didn't realize they needed or about things they don't actually need to spend money on! For example, in this project, they may have thought they needed new light fixtures but Jessica decided to keep their preexisting crystal chandeliers. Once the AutoCAD, preliminary budget, and design concepts are complete, the designer will build a digital and print presentation, in InDesign. These pages will usually include inspiration photos and AutoCAD layouts. These pages can be brought home and reviewed by clients after the meeting is over! Jessica and Stephanie set up for a design concept presentation! The final step of the Design Concept Stage is to present the concept to the client! 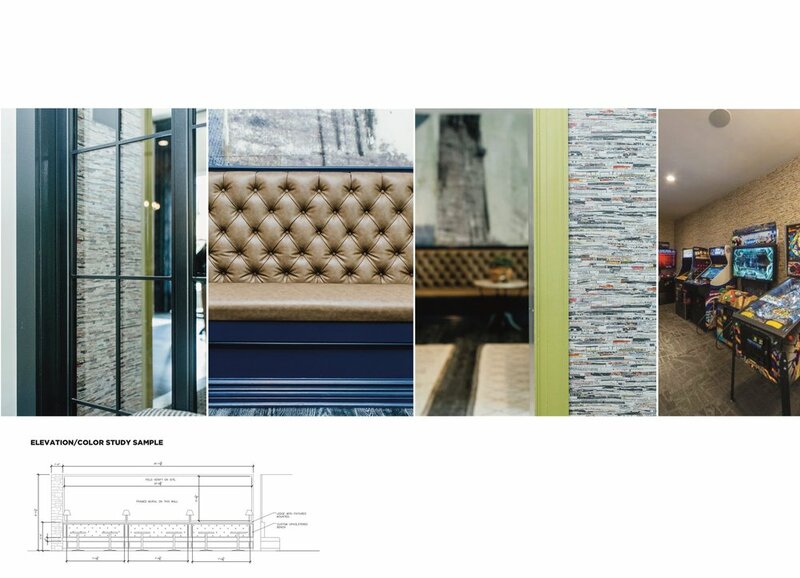 The Lead Designer, along with any assistants, set out the design concept pages, layout all fabrics, finishes, and wall covering samples, and pin items to the presentation board! We'll also layout snacks and refreshments for our clients in preparation for their visit. During the meeting, the client will either approve the design concept or ask for alterations. They'll also approve the space planning and budgets! Their feedback on all of these factors will influence the rest of the design and ordering process. Join us for the next edition of this series in which we'll take you behind the scenes for the next phase of the project! Interested in working with us on your project? Send us an email at hello@crimsondesigngroup.com! Back to School Design How Tos: Designing Your Dorm! It’s college move in week, all across America! Students will be moving into their first dorms and for some, this will be the first time living away from home. This week we share some of our tips for designing a dorm. From storage to lighting, we’ve got you covered. In today’s blog, read about one of our favorite local creators: muralist Sarah DeAngulo Hout! Beautiful interiors for homes, beautiful experiences for lives.